It’s crucial that we work to create a more sustainable future for ourselves and upcoming generations, and the work must begin now ― not with young adults, but with young children. When children play in nature before age 11, they are “more likely to grow up to be environmentalists than other children.” Additional research has suggested that kids who engage with the natural world alongside “significant others” like family members and teachers are more likely to protect that nature later in life. Much of what children come to know and understand is gained through social learning. As kids, we learn how to appropriately interact with one another and in society. We are taught not to hit or bite; we can’t simply take whatever we want from the toy store’s shelves. Children are also conditioned ― sometimes with purpose but usually without much thought ― to interact in certain ways with the non-human world. When a child sees an insect, for example, she looks to those around her for guidance on how to respond. When my oldest daughter was 4 years old, she discovered the larva of a green fig beetle buried beneath the dirt in our garden, and it practically became a family event. The experience only lasted a few minutes, but the questions persisted for weeks: How does the green beetle grow? How does it move? What does it eat? What eats it? This kind of curiosity and respect, when encouraged and allowed to develop, can later extend to spiders, bees, birds, forests and, eventually, entire ecosystems. How a child treats a new insect or interesting plant may seem insignificant, but these early, entry-level and everyday opportunities to connect with non-human nature are critically important. They scale up. They encourage children to consider their own position within the enlarged boundaries of a community and weigh the impact of their actions. As kids grow into adulthood, this mindset will be brought to bear on larger-scale questions and decisions that affect the world we live in. From curiosity comes learning, from learning comes respect, and from respect comes stewardship and advocacy. Operating under an environmental ethic may sound unrealistic, but it’s less complicated than it seems. Fostering a child’s curiosity is simple. Spend time outdoors; even a walk to the store is an opportunity for children to observe and be curious about their natural surroundings. If you’re a city-dweller without much land to call your own, plant some potted vegetables or herbs. The process of planting, growing and harvesting something they can actually eat is a powerful tool for connecting kids to nature. Let them get their hands dirty. Furthermore, most kids are fascinated by things adults consider gross and pick up on the idea very early on that certain things are “yucky.” Don’t scream and run away when an insect approaches. Show the child you are curious about the world around you, too. And remember: Sometimes less is more. 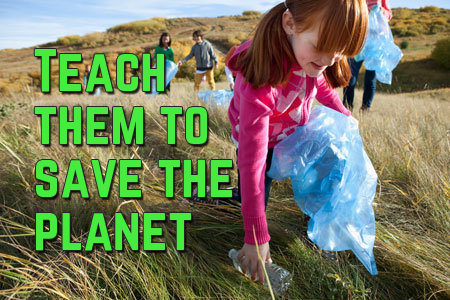 You don’t need to drag your child on a long hike every weekend to teach them to appreciate the environment. A nature scavenger hunt around the local park can be equally impactful. When weather doesn’t permit, watch nature shows as a family. Help children to understand the impact on nature and other creatures of the plastic choices we make. If they understand that a particular lolly stick or sucker stick is made of plastic rather than paper they will learn to choose the paper one.